It's the way I do things! This week Flourishes webstore released three new sets that I had mentioned earlier this week. I want to focus on the most essential element of a wedding…..The Bride ! You can’t have a wedding without a bride and mine today is ready for us to view…so let us throw open the chapel door, have the organ play the traditional Wedding March…Here Comes the Bride. Turn your head and see the mother of the bride beam with love and pride….. 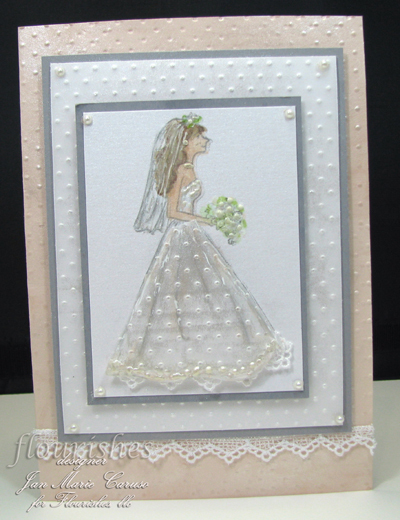 This bride is ready for her summer wedding…she is sparkly and dressed in dotted swiss…I paper pieced her skirt..vellum that had been Cuttlebugged..tapped gently with Versamark, and dusted with Pearl Ex. The hem of her skirt was dotted with liquid applique…treated with Pearl Ex and Stardust pens for a beaded look. Notice the lace peeking out from under her shirt..a small strip of lace from Hobby Hobby was attached with mini glue dots…Her skirt actually “stands out” from her slightly and again glue dots worked like magic…The bride was stamped with SU Going Gray on Ice Silver metallic paper and colored with SU Blush Blossom…her flowers were high lighted with Copics and then white liquid applique. I added a necklace and pearl earings a la liquid applique. Her veil was detailed with the new Ranger Inkssentials White Opaque pen and everything was treated to a generous touch of Stardust pens from Flourishes,llc. The card stockand another sheet of vellum were all treated to the CB…dabbed with Vermark, and dusted with Pearl Ex..the entire card has a pearlized look that is OH SO Pretty!…tiny pearls add the final touch to the corners of each layer. I hope she gave you an AH moment! The girls in the Wedding Party set are like dressing paper dolls when we were younger…I still love it as much. Thanks for stopping by the Atelier today…I’m sure there will be more to come for the wedding plans of our beautiful and beaming Bride. Oh to be that beautiful bride. This card is gorgeous. Wonderful work. I so enjoy your blog. What a pretty card. I am in love with that swiss dots cuttlebug folder.